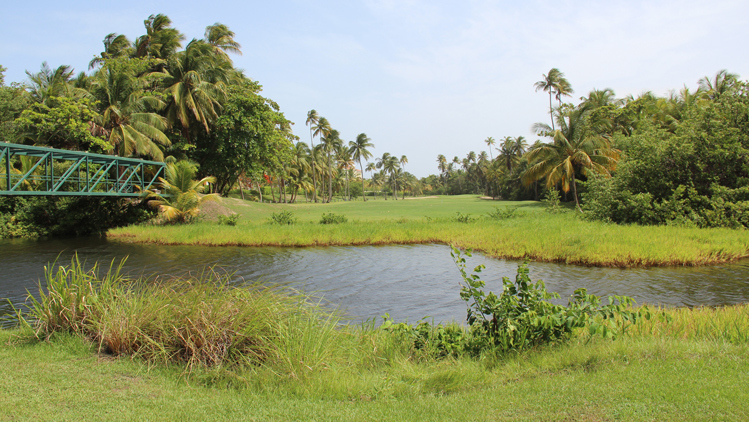 Palmas del Mar - Palm Course Hole 1: The first hole is an outstanding par five that doglegs left around native wetlands. However, there are also wetlands and thick trees to contend with to the right as well starting right in the driving landing area and continuing throughout the hole. The second shot is daunting with the fairway pinching in very tight around the 150 yard mark between hazards. The green is narrow and stuck between two deep bunkers and wetlands beyond those. so, this is a great hole from tee to green requiring a solid opening effort. Palmas del Mar - Palm Course Hole 2: Not very long, this dogleg left par four presents a lake left of the tee shot that then stops short of the green by a little. Errant drives right may also find tree trouble or hazard beyond so accuracy should be favored over length. The green is small but undulating. 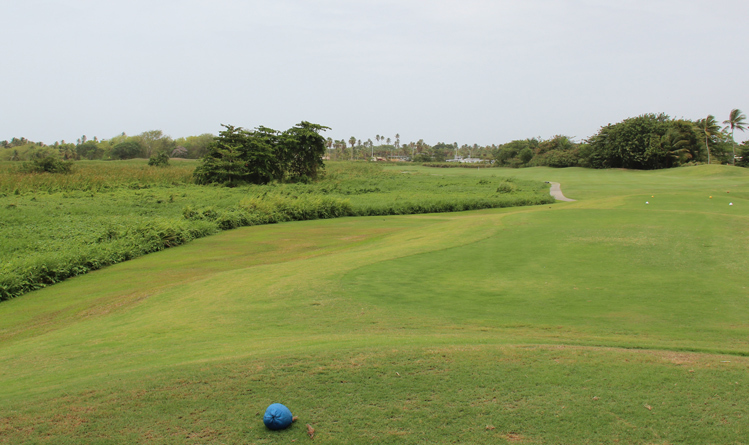 Palmas del Mar - Palm Course Hole 3: This short par three isn't particularly difficult, but one can see and hear the Caribbean beyond the Palm tree framed green that sits between bunkers short right and long left. 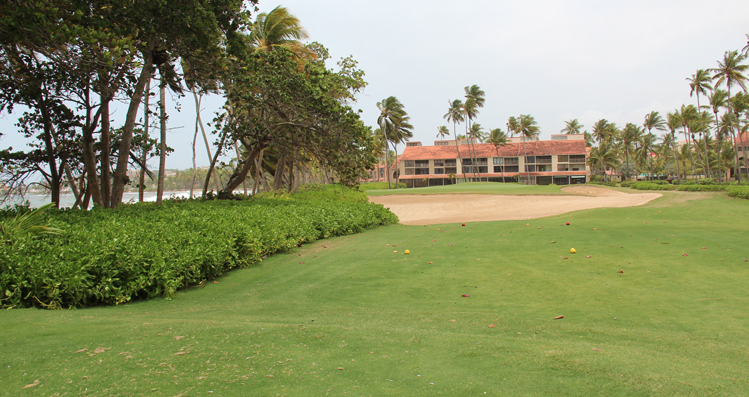 Palmas del Mar - Palm Course Hole 4: The second of back to back par threes is even shorter than its neighbor, but this one runs parallel to the beach. 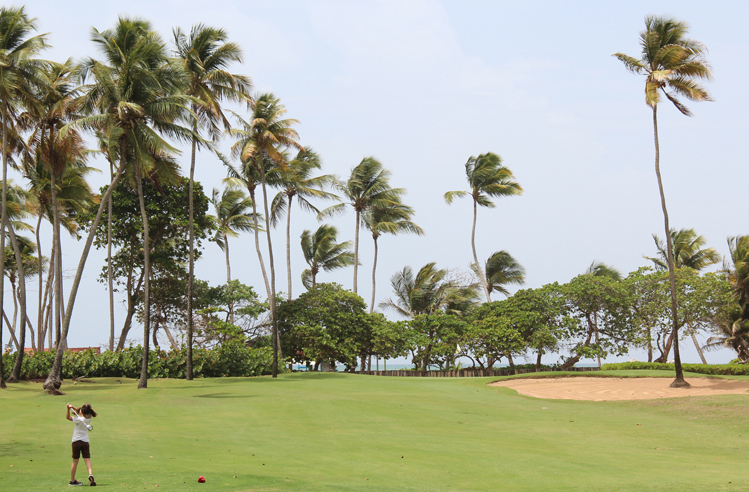 The thick trees to the left prevent shots from going on the beach in most cases, so the real "danger" is the large waste bunker short of the green. However, going long will leave a downhill chip to a green that is only 20 yards deep and pitched from back to front. Palmas del Mar - Palm Course Hole 5: If Gary Player wanted to emphasize the name of the course through hole design, he did it here. 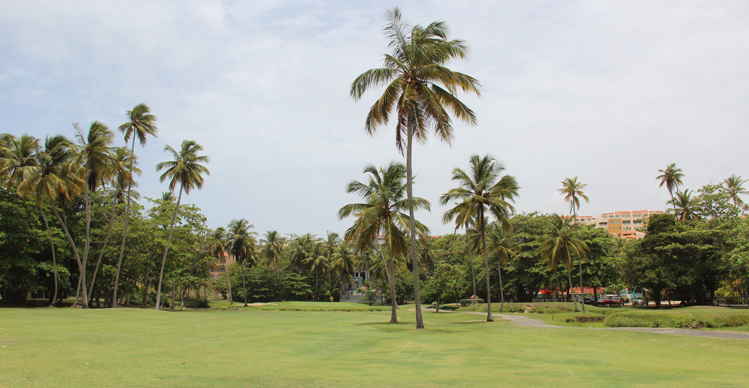 This slight dogleg right has a lot of Palm trees that the drive must work through and more on the second shot. The real danger off the tee is the pond to the right, but assuming the drive can find the fairway, the remaining trick is to avoid the water that is in front of the green and wraps around it to the left side..
Palmas del Mar - Palm Course Hole 6 (left): The tee shot here pretty much favors a draw, but one cannot go too far left as a creek is waiting over there on the first two shots. Water also comes into play about 10 yards right of the green, but otherwise, well-placed shots should make for a good scoring opportunity on this par five. 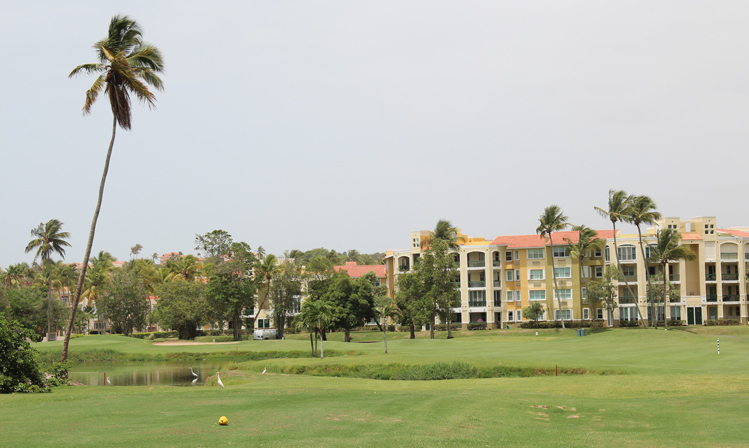 Palmas del Mar - Palm Course Hole 7 (below): There is nothing but trouble to the right on this tee shot so players should aim to the left side of the fairway. The green is elevated over a couple of bunkers but is fairly receptive. Palmas del Mar - Palm Course Hole 10: Played into the prevailing wind, this is a very tough par three, especially from the back tees, which approach 200 yards. it is all carry over the wetlands with only a steep bank of rough short of the green about 10 yards long to keep one "safe". There is also a bunker left and nothing but impossible chips from behind the green. 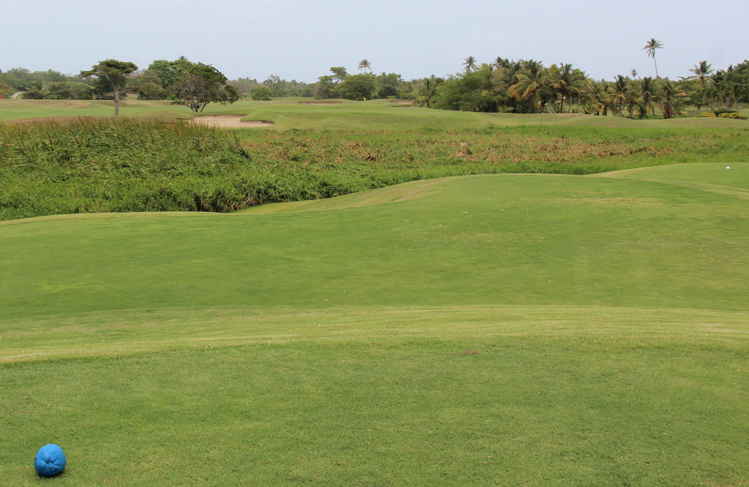 Palmas del Mar - Palm Course Hole 16: The back nine follows a path that features three dogleg right par fours in a row. Each of them has an elevated tee (varying degrees) and each of them then plays from the fairway back up a hill (varying degrees). This one is the shortest, tightest, prettiest and has the most interesting and fair green. Palmas del Mar - Palm Course Hole 17: This hole (pictured here from in front of the white tee) is long, straight and has horrible trouble in the form of thick jungle to the right and a resort and OB left. The green is skinny and contoured so the player really must hit two fantastic shots to best this very difficult par four. Palmas del Mar - Palm Course Hole 18: After the brutal 17th, this par five is a dogleg right around a water hazard but there is plenty of room to say left. The gambler can hug the right side to go for the green in two if the wind is not too strong in the face. However, the green is shallow from that angle and fronted by bunkers as well.